NMM 10230. Diatonic harmonica by Andreas Koch, Trossingen, Germany, ca. 1925. 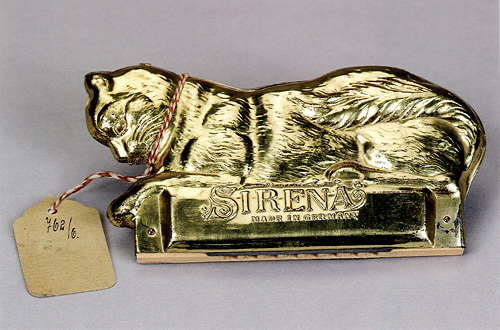 Sirena model in shape of a cat with a gold finish. A simple, child's toy, with only six reeds. Ex coll. : Deutsches Harmonika Museum, Trossingen. Alan G. Bates Collection, 2003.